Retrace the history of your favorite team through beautifully reprinted coverage from The New York Times. From the first pitch to the final home run of the season, nothing delighted the baseball buff more than to root, root, root for his home team. 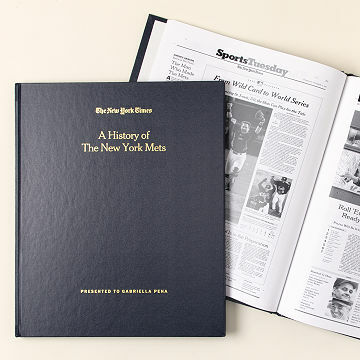 This personalized book retraces the history of your recipient's favorite Major League Baseball team through beautifully reprinted coverage from The New York Times's archives. As they flip through historic pages, they'll go back to their team's glory days, relive the most newsworthy games, and get to know the all-star sluggers. This winning collection of full-size facsimiles is preserved in a handsome library binding and can be embossed with your recipient's name for a personal touch. Made in Williston, Vermont. There's so much content that everytime you pick it up it's like you see something new you didn't see the first time. Got the Yankees edition for my dad for his birthday. He loved it so much that he actually teared up when he opened it. The font for most of it is REALLY small, much smaller than I had realized. I didn't order the magnifying glass that came with it (way too much money), so I just got a simple one from the store. I know it's costly for a book, but it's really special, and for a 68-year diehard Yankees fan since the day he could breathe, it was the perfect gift! This is a perfect gift for a baseball fan, especially if they also love history! I was impressed that the time span included from the very beginning of the team through two months before my order was placed. This product is amazing for any sports fan. I love how they include ads as well as all of the amazing material on the team. Wins, losses, scandal, and regular Joe seasons. I would suggest you spend the extra on the magnifying glass, though a small one should be standard at the lower price range as well. I bought this for my husband on his 45th birthday. He loves the Mets and was totally geeked that the book begins "when the Mets were born". The quality is very nice and the articles are authentic. Only suggestion is to make sure you get a magnifying glass. Some of the print is tiny. So unique! Very well put together. Amazing quality. Perfect for a baseball fan. Definitely avoid these "custom made" items if you have any sort of deadline. I ordered on Dec 13th for a Christmas gift and paid for expedited shipping to have it arrive by the 20th - it should have shipped by now but Customer Service has no way of tracking where the item is, when it will ship, or when it will arrive. Apparently this website uses outside vendors, who they have no way of contacting. Very risky if you ask me - only order if you'd be ok with the item coming late or not at all. It's too bad because it seems like it could be a great gift!